Venus in Chains creates avant-garde chain maille accessories mixing classic elegance with modern glamour. Venus in Chains combines the bold look of chain maille with the opulent sparkle of Swarovski crystal to create pieces that complement the modern fashionista while celebrating the art of traditional chain maille. 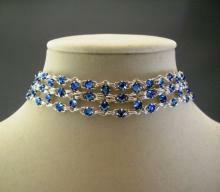 Genuine Sapphire Blue Swarovski Crystals make this elegant choker necklace a must for any glamour-gal! With over one thousand Peridot Green Swarovski Crystals and over 6,000 hand-woven silver toned jumprings, this sumptuous crystal chain maille bikini top is truly the ultimate in luxury! 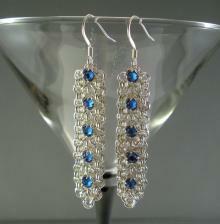 Daring drop earrings made with genuine Sapphire Blue Swarovski Crystals. Victoria is working on some new Swarovski-encrusted accessories! Support our friends at Pinups for Pitbulls and fight breed specific laws!